The BVLGARI Diagono Magnesium watch offers meticulous precision and innovation and blends traditional Swiss watchmaking with Italian creative design fusing the traditions of both countries. Each timepiece is manufactured entirely in Switzerland in the BVLGARI Manufactures. 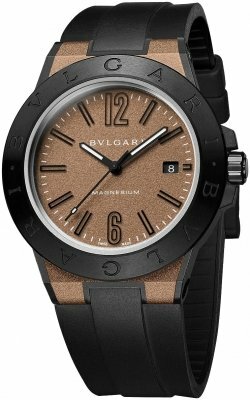 Using cutting-edge material, the BVLGARI Diagono Magnesium watch is sporty, elegant and engineered for the utmost performance. MAGNESIUM (Mg) & ceramic case which is lighter and stronger than titanium. This is a metal that is now being used in the motor racing and the aerospace industry to replace other lightweight metal alloys. MOTORLAC coating is a BVLGARI proprietary lacquer, and is inspired by the racing car technology to protect the case with a unique finish. PEEK is an advanced polymer that is used in aviation and space technology as a shock absorbing material. CERAMIC (Zro2) Unsratchable high-tech ceramic bezel. Speckled black & metallic bronze case and crown comprised of magnesium, PEEK (polyether ether ketone) steel, ceramic (on bezel). Speckled mettalic bronze 'Motorlac' (BVLGARI's proprietary lacquer) dial with BVLGARI logo in white. Black raised indexes with roman numerals used for 12 and 6 o'clock. Mettalic grey sword-shaped hands with speckled finish and white luminescent material. Instantaneus date with date window at the 3 o'clock position. 'MAGNESIUM' is printed in white above the 6 o'clock position. Black magnesium and PEEK case with ceramic bezel engraved with BVLGARI logo. Solid caseback secured by 8 screws. Black rubber strap with ardillon buckle. Bulgari Caliber BVL 191 - Solotempo, self-winding movement with côtes de Genève, chamfering and snailed finishing beats at 28,800 vph. This automatic movement is composed out of 191 parts, contains 26 Jewels & has an approximate power reserve of 42 hours.